Food is fuel. It runs your body just like gas runs a car. Remember everyone is different. Eat and drink foods that agree with you before exercising. Milk – both white and chocolate – is an ideal beverage for student athletes and active adults. Milk contains nine essential nutrients that you need, including some not typically found in recovery drinks. 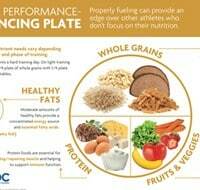 What should athletes eat and drink before physical activity? You don’t need extra vitamins, minerals or supplements — you just need to eat the right foods. Eating a variety of nutrient-rich foods from all five food groups will give you the energy you need every day. 30 minutes before the event, hydrate with 8-12 ounces of water. If you are continuously moving for more than 60 minutes, grab a carbohydrate/electrolyte boost, like a sports drink, with a small serving of fruit. After your event, rehydrate with a beverage rich in carbohydrates and electrolytes, such as lowfat or fat-free chocolate milk. It’s just what an athlete needs — a carb-to-protein ratio of 3:1, is a good source of potassium, and has a moderate amount of sodium.